How Oman was named remains a bit of a mystery. The area was called Mazoon, which stems from the word muzn, which means, “heavy clouds which carry abundant water.” The name Oman is thought to originate from the Arab tribes who migrated there from the Uman region of Yemen. Oman is the oldest, independent state in the Arab world. The official name is, The Sultanate of Oman and it is one of the few countries in the world that is run as an absolute monarchy. The Sultan, Qaboos bin Said al Said, has been the leader of Oman since 1970. He is the longest serving leader in the Middle East and the fourth, longest reigning monarch in the world. Oman is strategically located at the mouth of the Persian Gulf. Its neighbors are: United Arab Emirates to the northwest, Saudi Arabia to the west and Yemen to the southwest. 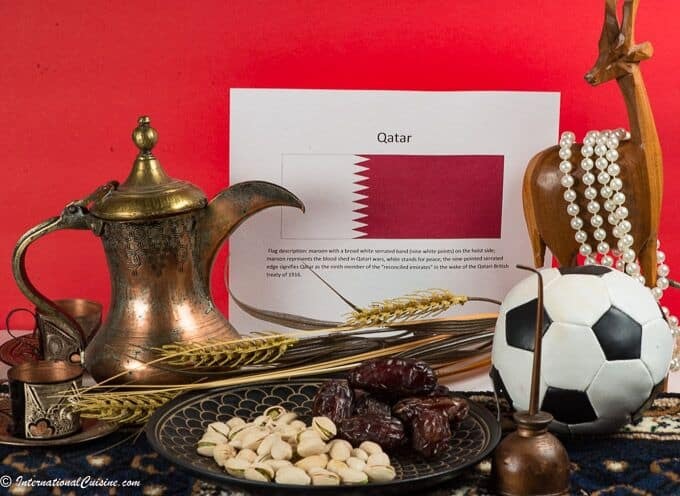 It also has two exclaves, territories called the Madha and the Musandam, which are surrounded by the United Arab Emirates, on their land borders and with the Strait of Hormuz and Gulf of Oman, forming their coastal boundaries. Oman shares marine borders with Iran and Pakistan. The coastal border is the Arabian Sea on the southeast and the Gulf of Oman, on the northeast. It is made up of towering mountain ranges, vast deserts and about 2000 miles of coastline. Oman has a fascinating history, as the area was a key place for trade for thousands of years. Recent discoveries in Oman have shown pre-historic, human habitation dating back over 125,000 years. Some stone tools found, resemble those made by humans in Africa, during the same time period. Oman is home to several UNESCO World Heritage Sites. A couple of these sites date back some 5000 years. They are called tombs but possibly could have been silos, as no human remains have been found. They are made of stone and shaped like a bee hive. There is a sense that there is much more yet to be discovered in the mountains of Oman. Ancient civilizations traversed through the deserts of the Middle East to Mesopotamia (Iran and Iraq). The camel caravans would carry incense, an extremely important product of antiquity. Oman is one of the few places in the world where frankincense trees grow. The Land of Frankincense is one of the world heritage sites. Additionally, ships carried copper and other various minerals by sea. Omanis often get credit for being some of the best shipbuilders in the world. Due to its strategic location, the region was impacted by several invaders. 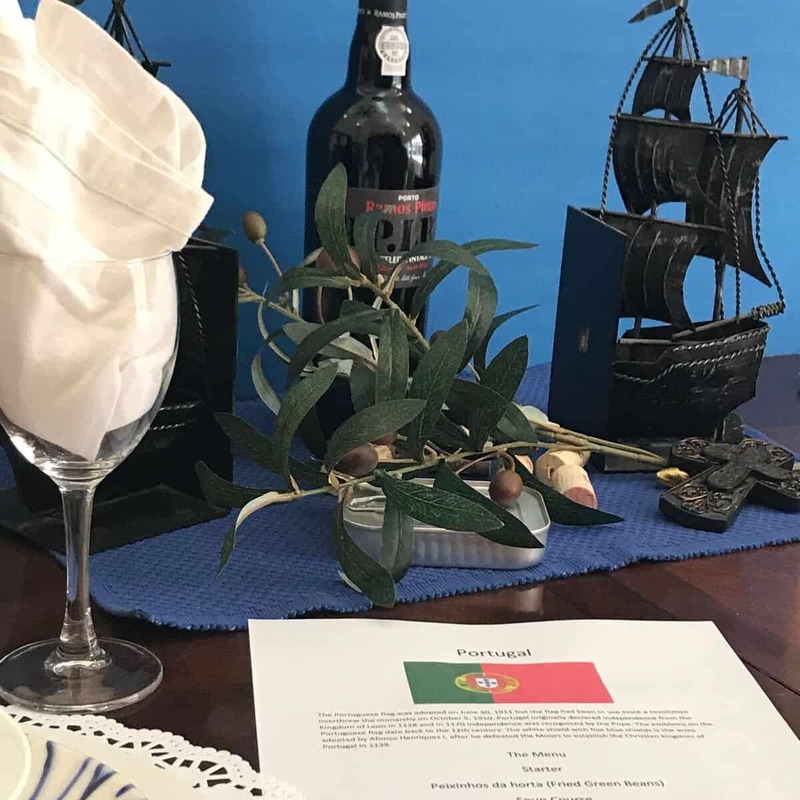 These included, other Arab tribes, Portugal and Britain. Oman at one time even had its own colony, which included the island of Zanzibar, off the east coast of Africa and was the place where Oman became wealthy from the slave trade. Oman also has oil wealth and reserves which it began exporting in 1967. It has tried to have a diverse economy that is not solely based on oil and gas. The economy has focused on tourism, fishing, mining and agriculture. The main crops grown in Oman are dates, limes, tomatoes, eggplant, bananas and carrots. Its most fertile land is found along the coast in the northeast. Oman is a Muslim country and governed by Shari’a law. Most of the Muslims adhere to the Ibadi sect of Islam, while the remaining are either Sunni or Shia. The Sultan is a member of the Ibadi community, however, the government does not give official preference to any particular religious group. Despite being a Muslim country, they allow freedom of religion and prohibit discrimination of individuals on the basis of religion. About five percent of the population is Christian, Hindu or Buddhists; mostly non citizen immigrant workers. 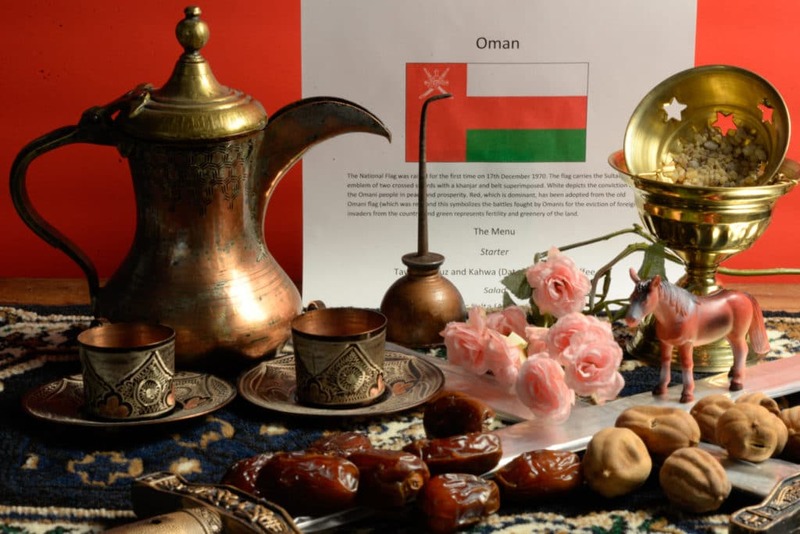 Arabic is the official language in Oman, although English is also spoken. In the capital city of Muscat, the Sultan Qaboos Grand Mosque was completed in 2001, built from 300,000 tons of Indian sandstone. It has a capacity of 20,000 worshipers. It is a popular tourist destination because of its beautiful architecture. In the mid 20th century and up until the 1970s, Oman was basically shut off from the outside world, until the current Sultan overthrew his father in a bloodless coup. Since that time, the country has opened up in all sorts of new ways. Prior to 1970 Oman basically had no national infrastructure. There were no hotels in Oman, yet today there are hundreds. Back then, Oman had only six miles of paved roads whereas today there are over 3800 miles of paved roads. In 1970, only three primary schools existed for just 1000 boys. Today, there are well over 500,000 kids (boys and girls) in over 1000 schools. Education is free up until the higher education level. Today the country has been totally transformed. The Sultan is often called a Renaissance man, for his transformation of a nation in so little time. Despite being run as an absolute monarchy, he is not considered a dictator. He has developed a constitution, as well as two houses of Parliament. A recent change in the constitution gives the lower house even more power. The Parliament consists of both males and females from all over the country. The Sultan is loved in his country and highly respected. The biggest concern in Oman is who will succeed the Sultan, as he has no children of his own. He recently spent eight months in Germany for an undisclosed medical condition. When he returned, the country erupted in celebration. As we look into the cuisine of this most interesting country, it is clear that they have many wonderful influences. Located along the spice trade route, their cuisine is loaded with the best and most expensive spices like: saffron, cardamom, cloves and cinnamon, to name a few. Oman was responsible for bringing clove to the island of Zanzibar. The main influences come from Persia, India, Asia, and East Africa along with her neighbors. In Oman, the cuisine is regional, however, most dishes have some element of curry, cooked meat, and vegetables. Seafood, is of course, very popular along its long, fertile coastline. Rice is a staple. 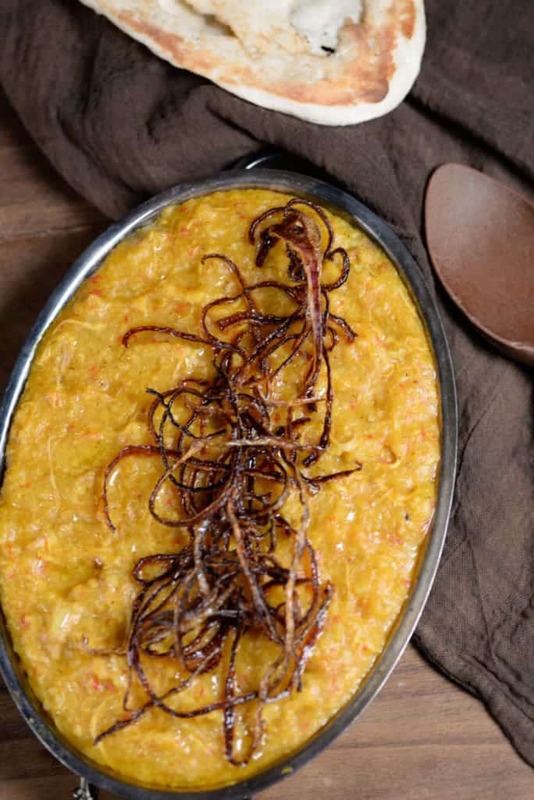 Omani cuisine is full of different biryanis and machboos, (Middle Eastern rice with meat and spices) but it also has its own unique element of beaten or mashed rice. This is rice that is cooked a very long time along with other ingredients, like chicken, to the point where it becomes like a porridge. Soups are also common and typically made with chicken, or lamb and vegetables. One element in the cuisine that is quintessential Omani, is the dried lime or black lime. The lime, which originally came from Malaysia, is dried in the sun until the shell becomes rock hard and the interior is a gummy black. This dried lime adds an intensive, citrusy, earthy, almost fermented flavor, to many of their dishes. It is a beloved ingredient in Persian cuisine and other Middle Eastern cuisines. In Oman it is called loomi. Shuwa is considered to be the national dish and requires a distinctive, underground pit. It is a time intensive dish that usually takes a few days and is reserved for special occasions. It is typically made with beef, lamb, goat or camel, with a mixture of spices and oil and then wrapped in banana leaves and placed in the pit. It is served over a massive platter of rice. It is a big production, in both the preparation and in the enjoyment of the feast. Alcohol is available in Oman but requires a special license, proving that you are spending less than ten percent of your income on it. Pork is strictly forbidden. We set the scene with a special coffee pot called a dallah. For this meal, we were honored to have my sister and her husband as our guests. We began by saying, “As-salem alaykum”, which means “Peace be with you,” in Arabic. 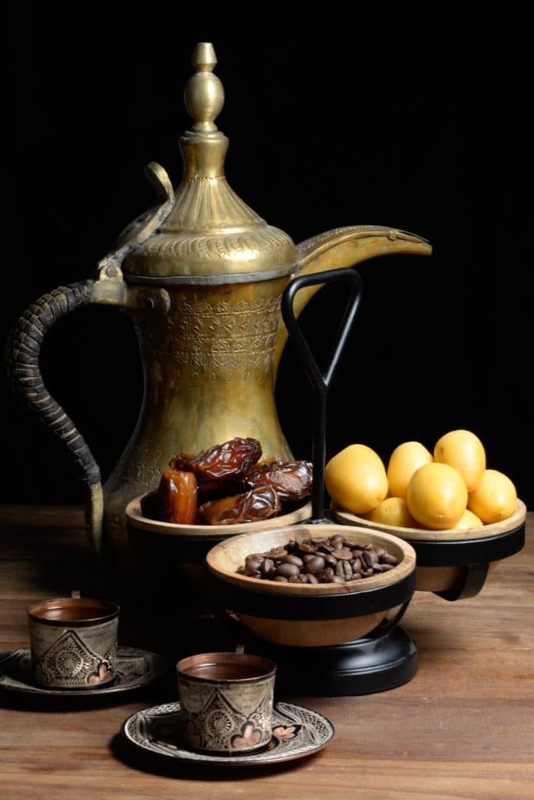 Coffee and dates are the ultimate form of hospitality in Oman. The hot Omani coffee is served in little cups without handles called fenjans. The coffee is lightly roasted and ground with cardamom and often times rose water is added to the mix. Dates are served as a sweetner for the coffee. Your coffee will be constantly refilled until you shake your cup vigorously, signalling that you have had enough. You will be offered coffee and dates just about everywhere you go in Oman. We began our meal with coffee and dates, both fresh and dried, along with some nuts. It was the first time we had ever had a fresh date and we loved the crunchy texture and sweetness. For the dinner setting we included a rug, as sitting on the floor and eating with your right hand is how food is enjoyed by the locals in Oman. An Arabian horse figurine was placed, since they are believed to have originated in Oman and Omanis are known to be some of the best, Arabian horse breeders in the world. Dried limes and spices were also positioned, along with a incense burner filled with frankincense. I don’t think I ever had the privilege of smelling frankincense before and it turned out to be a lovely, earthy scent that we all enjoyed. Pictures of elaborate carved doors were also added, as they were one of the things I loved so much about our trip to Stonetown in Zanzibar. (I really wanted to bring back a set of carved doors,) I loved them, and it turns out Oman is full of them. Even the smallest, most unassuming abode, will be graced with a spectacular entry door. Our next course was a spicy cirtusy seafood soup called paplou. 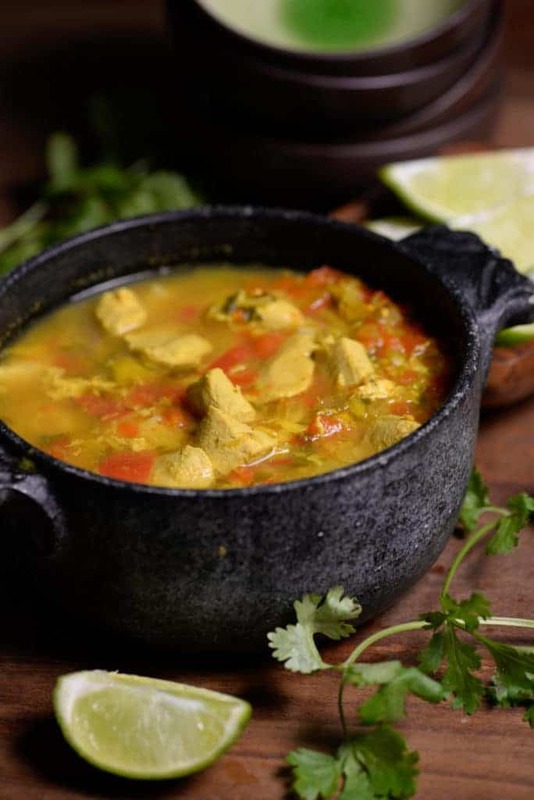 It was made with those dried limes and fresh lime juice, which was a perfect balance to the spiciness of the broth. There are many variations to this dish but generally speaking it will contain, black lime, onions, tomatoes, turmeric, chili and fresh tuna. It is served over a scoop of basmati rice. We loved it! Next were three dishes served communally, all at the same time. 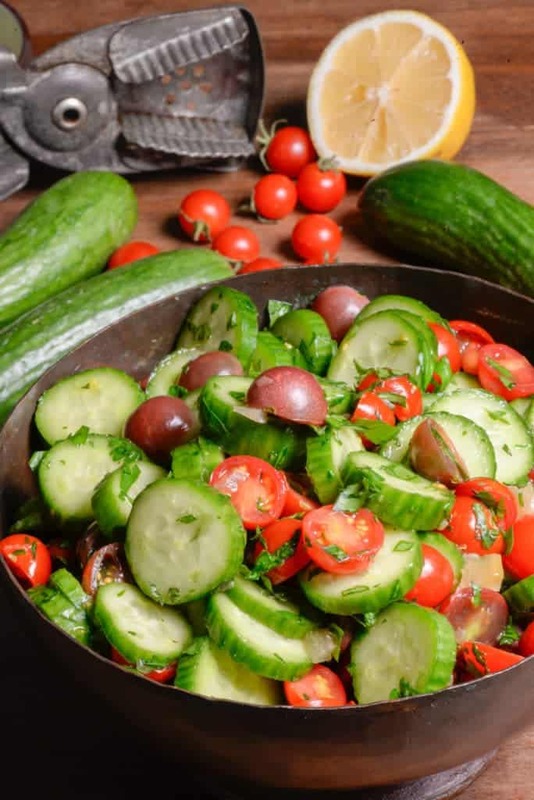 It was a simple Omani salad that had cucumbers, tomatoes, onion, parsley and mint but what made it unique was the addition of preserved lemons. These are like a pickled lemon and added a unique element to the salad. This was another keeper, everybody loved the salad; simple and delicious. The main course was called madrouba, which literally translated means, “beaten rice.” Despite the long cooking time, this dish is pretty easy to make and will infuse your kitchen with wonderful scents. It has many spices but is not a hot spicy dish at all, it is simply a flavorful one. It was enjoyed alongside Omani bread called khubz which is simply made with flour, water and salt. 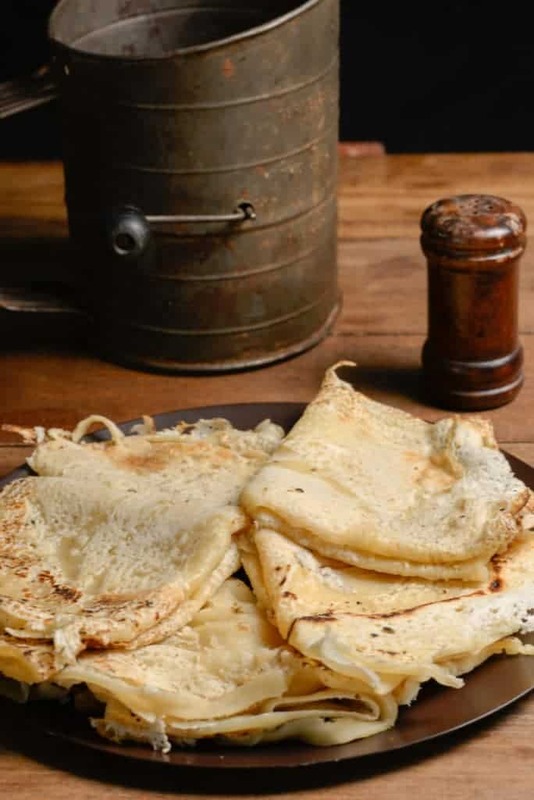 It is cooked on a stainless flat surface above a hot flame where the dough is just lightly touched to the surface resulting in a very thin almost lace-like piece of bread. The bread is not flipped but removed from the pan with what resembles a paint scraper. It was very delicious hot off the grill. For dessert, we served a small bowl of Halwa. 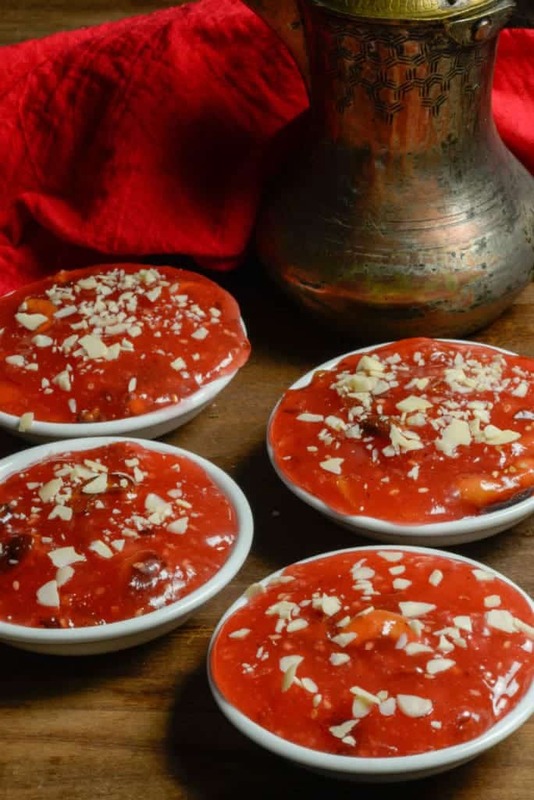 This is a gelatinous, sweet dessert made mostly of sugar and water and then flavored with saffron, cardamom and nuts. It was a lovely end to our delicious Omani meal that left us wanting more. Wonderful recipes! The salad sounds easy and delicious! And I seem to remember that you wanted to bring home a door from Tanzania, as well, Darlene! Thanks Caroline, yes indeed I really wanted those beautifully carved doors. Dan wanted to know what I would do with them, and I think decided against them when my answer was, build a house around them. You should make the salad it was really easy and delicious! Thanks for following along.